Take note from self-publishing Outskirts Press author, Dean Fredrikson, who is taking his latest book, Creation and Creation’s God, on tour – a virtual book tour, that is. He will be featured on several blogs over the weeks and months ahead so keep your eyes peeled to learn more about him and his book. Luckily for us, Dean was kind enough to answer a few questions as the tour was getting started so that we can give you a sneak peek into the mind of the creator of Creation and Creation’s God. OP: Tell us a little bit about Creation and Creation’s God. What is it about? 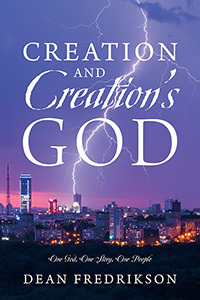 DF: Written for concerned, literate, more or less Christianized readers, the book explores the apparently obvious idea that a creator is different from what he creates. Third and fourth century Christian leaders labored to show that Christianity was in this way different from Greek pantheism. The natural world, as we experience it, is not, as Shirley Maclaine once thought, an expression or embodiment of God. Adam, though made “in the image of God,” was still an element in this changing, temporal, physical world. All attempts to know the truth through our experience of material existence must fall short of knowledge of the ultimate reality that both science and theology seek to know. I address two problems: one is the habit of modern readers to accept the Greek naturalistic bias as the rule by which the truth of Christianity is to be judged. The result has been the desperate attempts of Christians to defend the Genesis record by proving evolution wrong. The contingent truth of modern technology, leading to many good (and bad) things, is entirely consistent with the distinction of creator from creation, but as such it could never prove the truth of Genesis. I want my readers to see Genesis and the Bible as a world view statement, not as a series of pseudo-scientific, Red-herring side tracks. More important, the Genesis account tells us of a purposeful creator who intends real flesh-and-blood persons to learn to spell out his vision of a truly good, loving people in the context of bodily life in this material world. The creator was free to create as he wished. He created morally free persons because he would not get what he wanted if he coercively determined our obedience. The idea of a supreme creator who seeks the highest good of his creatures both frees us to be real persons and also confronts us with his reality. DF: I will skid the question just a bit. The book is directed especially to college students and achieved professionals who have not suffered “the closing of the American mind” regarding the question of human origins. It is also directed to Christians who fear science because it is commonly represented as philosophical naturalism and therefore anti-Christian. Within the self-imposed limits of modern empirical science, it is not! I very much hope such people will read the book. DF: Soren Kiekegaard’s (and my) critique of “scientific reason” puts the book at once in a slightly populated category. Relating obvious phases of the Genesis story of creation to the idea of a biblical God who continues to work creatively in the lives of modern persons is both elemental and almost unique in the modern world. As I note the categories of books offered on Amazon, Christianity Today and the various interactive media, I do not find one in which this book fits. Philosophy (metaphysics) is not generally written for popular consumption; and yet every explanation we offer about anything is philosophical. Books on theology for non-professionals are generally church related; and “how-to-be a good-and-happy-Christian” books, of which there are plenty, are superficial. This book is an introduction philosophy-theology for every intelligent, literate person who has any interest in Western civilization and particularly in Christianity. Alvin Plantinga’s book, Where the Conflict Really Lies, highlights the distinction of philosophical naturalism from what might be called legitimate science. Abraham Heschel, The Prophets, carries the biblical Story about the “people of God” as far as a Jew can be expected to do, but falls short of a conclusion. DF: While I have done a lot of writing for academic purposes, this is my first address to the American public. I am now working on a book on the idea of church that I hope to publish if I live long enough and have the financial resources to do so. OP: Thanks for your time, Dean! We look forward to learning more about you as you visit other bloggers! Dean W. Fredrikson holds a BS and MA from the University of Minnesota, with additional studies at BIOLA University and the University of Oklahoma. He served for 24 years in Portugal as a builder and instructor, taught at the Oak Hills Christian college for 22 years, and retired in 1998. Next Next post: Last Day to “Choose Your Own Promotion” When you Self-Publish Your Book!